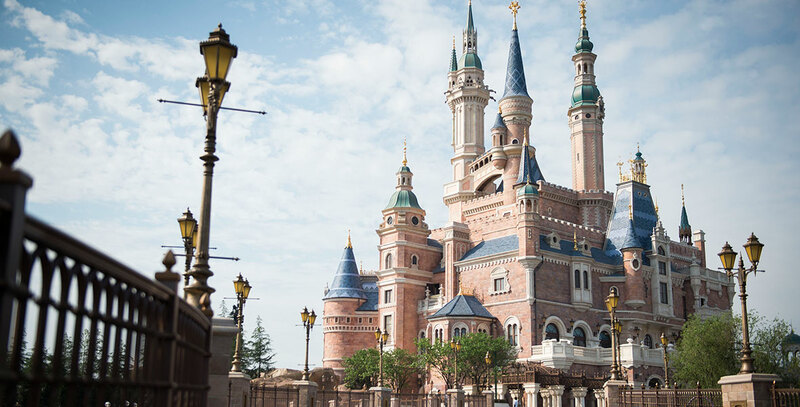 Enchanted Storybook Castle Central attraction and Fantasyland landmark at Shanghai Disneyland; opened June 16, 2016, with the Royal Banquet Hall restaurant, Voyage to the Crystal Grotto, “Once Upon a Time” Adventure, and the Bibbidi Bobbidi Boutique. The structure is the tallest and most complex of all the Disney theme park castles and the first to represent all the Disney princesses. Storybook Court inside the castle offers character greeting opportunities with Disney princesses and other royal friends. Outside the castle is Storybook Castle Stage, featuring musical performances during the day and a nighttime spectacular with lasers, projections, and fireworks.